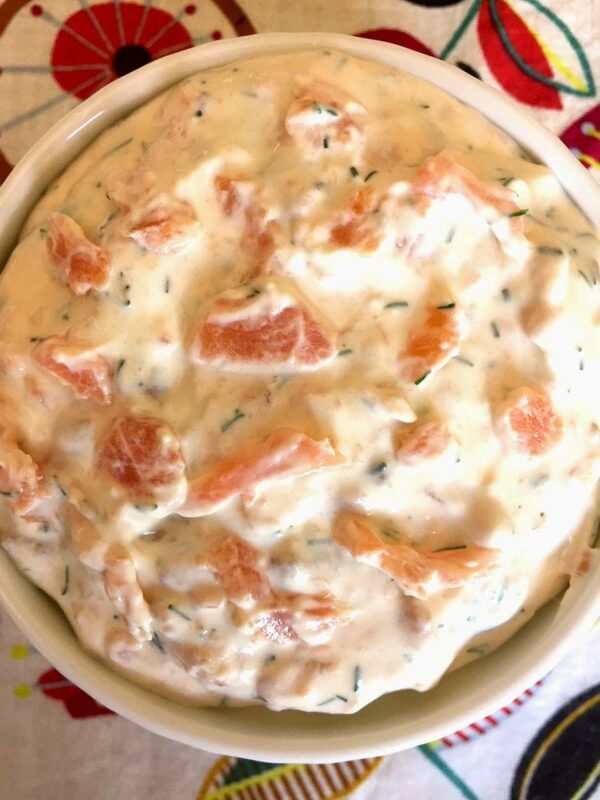 If you’re ever in need of a festive and elegant dish to make for a party, this Smoked Salmon Cream Cheese Dip will save the day. 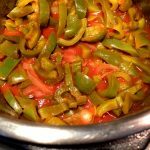 Bonus – it’s super easy and quick to make! We’ve all been there – it’s a special occasion or a fancy party, where you need an appetizer or “small plate/tapas” dish that’s out-of-the-ordinary and will impress. But, you don’t want to spend hours in the kitchen, or try something complicated and difficult that could fail. 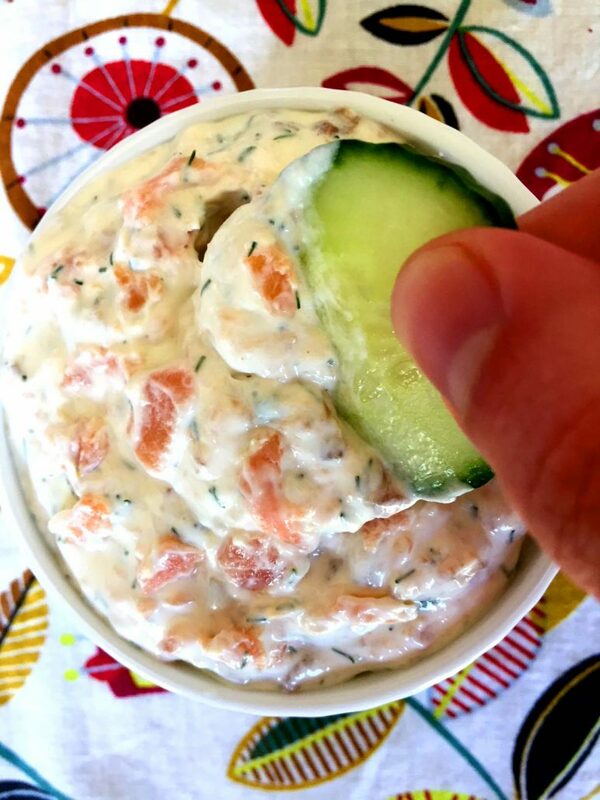 This Smoked Salmon Cream Cheese Dip or spread is your answer. And, it’s easy to transport if you aren’t the hostess. This beats any store-bought smoked salmon spread or dip hands-down! You won’t believe how luscious it is – soft and creamy, with a real smoked salmon flavor (and you know how everyone loves the real thing! ), and a subtle tang from the cream cheese and sour cream, and the freshness of dill. This is a dip to impress! 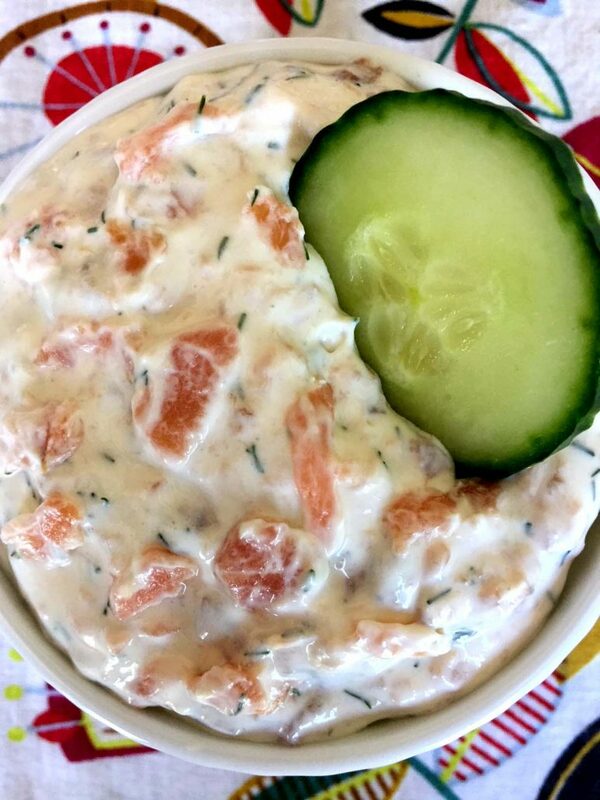 Yes, this Smoked Salmon Cream Cheese Dip is every bit a fancy pants dip, Yes, it does cost a little more than buying that packaged one in the store, but it really is worth it! It tastes SOOOO MUCH BETTER! 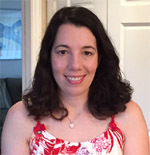 And, it is quick and easy to put together. It’s flavor money can’t buy! If you’ve ever tried store- bought Smoked Salmon Dip, you know that it tastes almost sour and only mildly of smoked salmon. And let’s be honest, it can’t be real because real smoked salmon has to be consumed with 3 – 5 days after opening the packet. 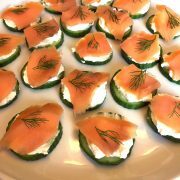 So, go homemade, with the real thing, no artificial flavor, no preservatives – real fresh smoked salmon. And as a result, it truly tastes like smoked salmon. Really truly! Smoked salmon is not the cheapest thing in the world, especially if you get good quality. Because you use a small amount, and the taste really comes through, buy the best quality you can. Using it in a dip is a good way to make less go further because when it’s blitzed up in the food processor, it makes the flavor bloom! It’s much more intense than stirring chopped salmon into the dip. I like to use a combination of cream cheese, sour cream (to lighten up the mixture a bit, I find using only cream cheese is too dense) and mayonnaise (for a bit of extra richness and flavor). You can serve it with crackers and cocktails, set it out on a brunch buffet with bagels or serve it with cucumber slices for a low-carb treat — either way, it’s a hit. Betcha you’ll get asked for the recipe, and no one will believe how easy it is to make! Smoked Salmon Avocado Rolls – many things taste amazing with avocado, and smoked salmon is no exception! Caprese Salad Skewers – cherry tomatoes, basil leaves and fresh mozzarella balls are threaded on toothpicks – how cute is that? This is going to be your next favorite appetizer! Bacon Wrapped Asparagus – talk about elegant! Awesome roasted asparagus wrapped in crispy brown bacon – mmm! Honey Baked Brie – baked brie is always a hit! 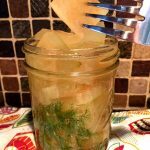 This recipe is so easy and people devour it! Always a hit at a holiday table! 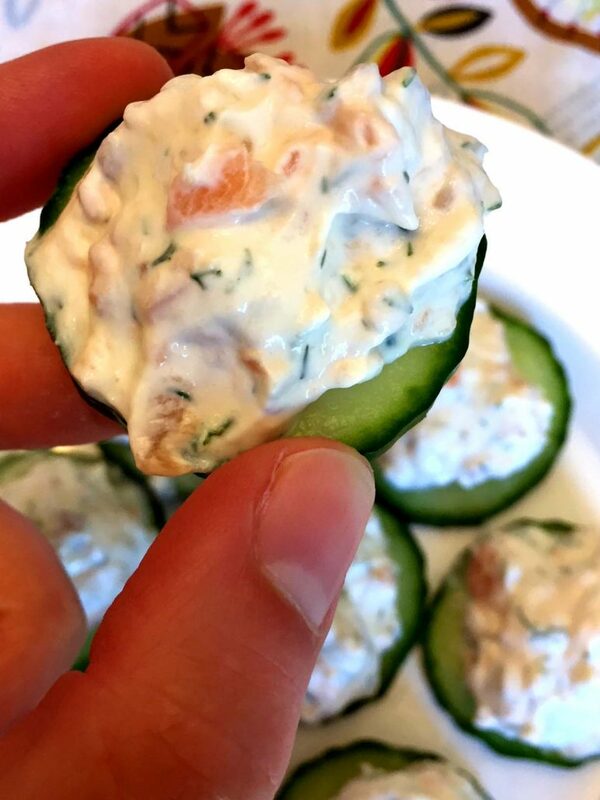 Baked Pita Chips – serve these homemade pita chips with the smoked salmon cream cheese dip – perfect combo! 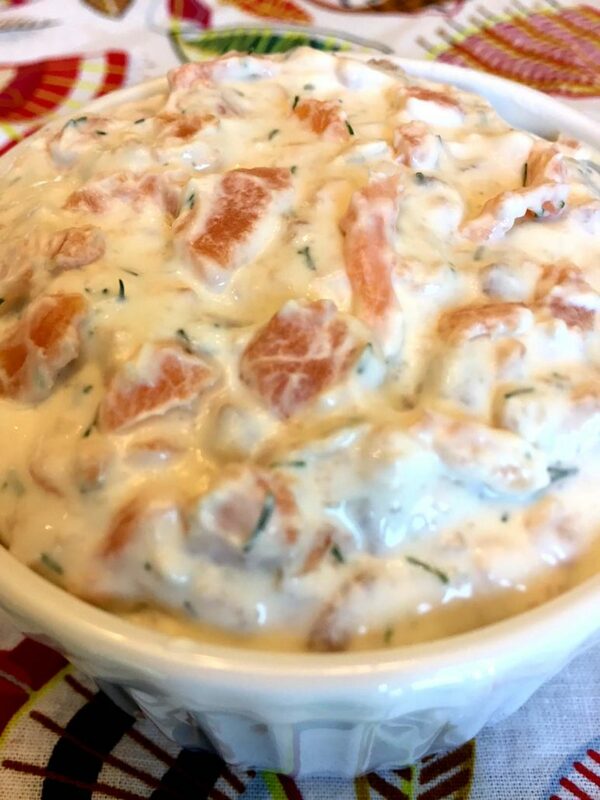 This smoked salmon cream cheese dip is so addictive! You just won't be able to stop eating it until the bowl is licked clean! So easy to make and always a party hit! Put all ingredients in a food processor and pulse until desired consistency.